The common ‘Brake Pressure Sensor’ fault has famously affected almost all Makes of vehicles including Citroen, Peugeot and Renault. On earlier models the brake pressure sensor was mounted externally on the ABS pump or near the brake master cylinder / brake servo. The external sensor was much more reliable but if the sensor did ever fail, a replacement could be purchased from dealers and parts factors at a very low cost. Newer ABS pumps (namely the ATE MK60 ABS Pump and later) are now being manufactured with the brake pressure sensor installed internally and it’s not a case of if, but when it fails – there is no option to buy and replace the sensor unit. Dealerships will require you to purchase a complete new ABS pump at a very high price. When you have a Brake Pressure Sensor fault, you will be advised to replace the ABS pump and the expected cost of a new replacement unit will be £1200+. The new ABS pump will require programming after fitting which is an additional cost. Below is a shot list of some of the most common Citroen, Peugeot + Renault vehicles we are taking calls for daily with the ESP fault. Peugeot 206 Peugeot 207 Renault Laguna II And More..! The ABS pump will have failed due to a common known manufacturing defect and replacing it with a like for like new or used part may rectify the fault temporarily but you can expect it to fail again in the near future. There is also the option of purchasing a standard rebuilt part or a repair kit as some parts factors are now offering. This is simply a repair to the existing part by replacing the sensor with a like-for-like part.. It is in no way a superseded part and will carry the same design fault. What we offer is very different. 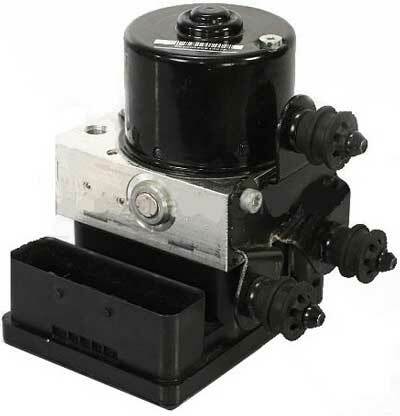 We remanufacture the ABS pump, bypass the internal pressure switch and fit our very own custom manufactured external brake pressure sensor and calibrate it to completely eliminate the possibility of a repeat failure. This is the only way to remove all risks of the unit failing again and this is why we are confident enough to offer our units with a LIFETIME warranty. What’s more our units are now Self-Calibrating so even if you purchase an exchange part from us, the ABS unit we send to you will self-calibrate to your vehicle and will not require programming – Guaranteed! There are rumours of people and/or companies trying to repair the ABS units and in some cases imitate our work by modifying them. Please understand that although the ESP system is not absolutely crucial, modifying the ABS controller/pump in any way (without superior extensive knowledge) in the technology of advanced braking systems and electronic control modules, you will be risking the life of others. Please do not attempt to repair these units yourself and please do not offer such services to trade or the general public. We have been in business since 1972 as a group company and all our parts & services are fully tested before leaving the workshop. All units are thoroughly tested on specific specialist equipment to ensure maximum quality. Our ESP Fault Modifications come fully approved and as far as we’re aware, there is no other company out there that can successfully repair these units and completely remove the defective state. If you have a Citroen, Peugeot or Renault with an ABS fault, then email or call us today on 0844 847 9999 for an instant quote. Tags : 10020600144, 10020600154, 10020601684, 10020602524, 10020602534, 10020602564, 10020603154, 10020603174, 10020603284, 10020603294, 10020603344, 10020603464, 10020603834, 10039929764, 10096011693, 10096011703, 10096011733, 10096011843, 10096011853, 10096011883, 10096011913, 10096011953, 10096039203, C1301 Brake Pressure Sensor Fix, C1302 Brake Pressure Sensor Fix. Hello, how mutch it cost an abs/esp Unit for a citroen c2 1.6hdi 109hp. Thanks. I have a pug 308 1.6 Sport diesel abs fault and esp fault code c1301 pressure sensor been quoted 550 for new pump from Peugeot can u beat that in any way??? We do carry some units in stock but I’ve done a quick check and noticed some errors in the part numbers you have provided. I have sent you an email, kindly reply to the email with the correct part numbers and we can price it up accordingly if we have it available for you.